David Cunix is a Managing Partner at Bogart, Cunix & Browning and a passionate Corned Beef connoisseur. This guest post covers a truly unique Corned Beef experience. This post may also be viewed in Again? Really? If you want to guest post on this blog, check out the guidelines here. This little adventure began at the Plaza Hotel in New York City. We were at a black tie wedding. Sally, my girlfriend, was wearing a floor length gown. We were there for the groom, her youngest nephew. This was an Orthodox (traditional) wedding. Most of the guests were present hours before the official ceremony. The groom was busy signing the Ketubah (wedding contract) while the bride was surrounded by friends and relatives in an adjacent room. The guests wandered back and forth between the rooms, celebrating, socializing and, of course, eating. There were three large bars plus the ever-present wait staff offered glasses of Champagne and white wine. Others were carrying trays of finger food. There were two 12 foot tables of sushi, attractively arranged and all completely Kosher. And in each room near the sushi tables were carving stations. Please remember that this is all a precursor to the wedding and a fabulous dinner. But you can work up quite an appetite at an Orthodox Jewish wedding, what with all of the music and spontaneous dancing. We grabbed some plates. I selected a few pieces of sashimi and then met Sally at the carving station. The chef deftly carved a whole turkey and offered slices from the breast. There was also steak and something else. Even in the dimly lit room the color was the unmistakable dark pink of CORNED BEEF. But the shape was wrong. It was almost rectangular. Two slices found their way to my plate. It was corned beef, but it wasn't brisket. It was, however, warm, incredibly moist, and tender. The flavor was bright with more than the usual hint of pickling. This corned beef needed nothing. Rye bread, mustard, and horseradish were all superfluous. Taste. Texture. Color. My tux and upbringing were the only things keeping me from pulling up a chair right next to that carving station. Back in town I discussed the corned beef with Boris Mikhi of Boris Kosher Meats. He guessed that it might have been a rib roast. That would be one expensive sandwich. The cut looked an awful lot like a chuck roast that Boris sells as a fish tail roast. He offered to cut, trim, and corn one for me. Cover the meat with cold water. Throw in a little garlic powder. Bring to a boil. Cover and simmer for about four hours. The meat is done when a fork can be easily inserted all the way through the thickest part. I removed the roast from the water and let it rest 10 minutes. I admired my handiwork as I carefully cut it against the grain. The color was perfect. The texture - excellent. It was delicious. Sally said that it was as good as the Plaza's, but I think she was feeding my ego while I was feeding her dinner. Truth - This version is as good, if not better, than any corned beef I've had in Cleveland, but it didn't quite equal the Plaza's. The texture was close, but not the same. The flavor wasn't as intense. Both of these issues may be resolved in future attempts. The best corned beef sandwich in Cleveland could be at YOUR HOUSE. Your butcher is waiting for you. And if you decide to visit Boris, tell him I sent you. 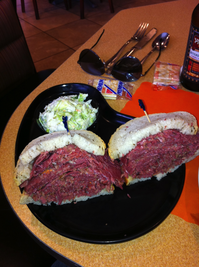 Jason Brill is a guest writer and sandwich eater for Best Corned Beef in Cleveland. He recently visited Jack's Deli and Restaurant in University Heights and tells us about his experience. If you want to guest post on this blog, check out the guidelines here. For as long as I can remember, I have had a love affair with corned beef. I didn't spend my childhood in Cleveland, though I was born here. We did come back a few times a year, and as a young Jewish kid who lived in Southern Texas—a place devoid of corned beef—one of the joys of coming back was the regular visits to Corky & Lenny's. And I'm talking dingy, wood-paneled Corky & Lenny's at Cedar Center. Another oft-visited deli was Jack's Deli and Restaurant at the corner of Green and Cedar in University Heights. As I moved back to Cleveland, and as Corky's made its move to Chagrin Blvd., Jack's quickly became my favorite deli haunt. To me, the corned beef is always juicier at Jack's. The soup is more comforting. The service is—well, it doesn't take much to top Corky's in that department, but Jack's has always been more welcoming. So when the fine gentleman here at Best Corned Beef in Cleveland asked if I'd like to do a guest review for Jack's, I couldn't pass up on an excuse to feed my corned beef craving. After starving myself all day in preparation, my dining companion—the wonderful young lady responsible for the blog Hip & Healthy—and I headed to Jack's. After a long day of work, the best way to unwind and prepare for corned-beefy goodness is a good brew—a He'Brew. As my companion put it, "It's the best Jewish beer I've ever had." Think Great Lakes Brewing Company's Lake Erie Monster. A perfect companion for what's to come. I cannot come to Jack's without getting the meal-in-a-bowl known as: The Whole Magilla. It's an extra-large bowl of chicken soup with a matzoh ball, rice, noodles, and a kreplach (a meat filled dumpling). Next up: the pièce de résistance. The corned beef. I ordered the regular-sized corned beef on rye. I usually keep my sandwich totally plain. If I'm feeling a little saucy, I will throw on coleslaw and thousand island dressing. The corned beef at Jack's just tastes fresh. It's juicy, and it melts in your mouth. 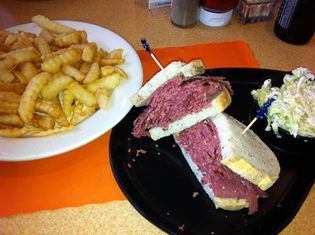 My companion ordered the not-so-hungry-sized lean corned beef on rye. She put some spicy-brown mustard on it, and she was soon wearing a satisfied grin. A side of fries and complimentary pickles round out this perfect gastronomic adventure. One other item of note is the corned beef and potato pancakes. It isn't on the menu, but you can usually order it if you act like you know what you're asking for. It's a sandwich-sized helping of corned beef betwixt two—wait for it—potato pancakes. The prices are on par with Corky's for most menu items. The beers were shockingly-priced, but that's our fault for not even asking. We tend to order off the cuff and worry about silly little things like price later. Our corned beef cravings quenched, we ventured out into another soggy spring night. 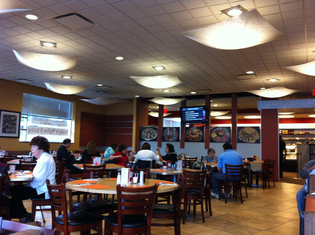 Jack's Deli and Restaurant is located at 14490 Cedar Rd. in University Heights, 44121. They are on the web at: www.jacksdeliandrestaurant.com.